Fiction: My job will be less fulfilling if I get “stuck” in a Shared Service Center. There is life after shared service centers! In fact, the shared service center model provides increased levels of employee support. This means more training, a well-defined career path with real advancement prospects, and a reporting relationship to a supervisor who knows the work you do and can advocate for the support you need. You’ll also still be closely aligned with the unit or department that you serve and will be able to maintain these relationships over time. Fact: I may not have the same job after the Shared Service Centers are implemented. Implementing shared service centers will realign current job responsibilities for many staff members and reduce the overall administrative needs on campus. As a result, there will be opportunities to apply to work in a Shared Service Center, move offices, or take on a new responsibility. It is true that some of the positions in your current area may no longer exist, but there will be frequent communication and opportunity for input as the Shared Service Centers are slowly phased in over the next three years. Some staff will be reassigned to support the academic mission of their department. Fiction: Shared service centers are just a fad and won’t make a big difference in the end – If I wait long enough, things will revert back to the way they were before. The Provost and campus leadership team are committed to increasing the focus on customer service, improving services on campus by creating streamlined best practice processes for getting work done, and enabling more and better training for staff. In addition, by changing how the work is done across campus, KU expects to save nearly $2 million per year. This savings can be channeled into the Bold Aspirations strategic plan. Fiction: A shared service center is a corporate organization that is incompatible with KU. The Centers at KU will provide business transactions in Research Administration, HR, and Finance so departments can focus on their academic and research missions. Once implemented, the Centers will be able to identify innovative ways to support the academic mission of the University through the services they provide. Fact: The KU Shared Service Centers will standardize processes across campus. One of the first steps in implementing Shared Service Centers will be to standardize processes across campus for certain HR, Finance and Research Administration functions, creating standard operating procedures supported by training. However, there may be some variation in processes unique to each shared service center, based on the needs of the units and departments served. Fiction: There is too much change happening all at once. Now is an exciting time on campus! With so many changes occurring at once it is easy to feel overwhelmed. New system implementations provide a perfect opportunity to rethink existing processes. Shared service centers are a good platform for us to consider how to simplify and perfect transactions that are commonly performed across campus. Fiction: Administrators are the only ones who want to implement shared service centers. Certainly, administrators and Kansas taxpayers are key stakeholders in the decision, but students, faculty, deans, and staff are directly dependent on the services that will be performed by the Shared Service Centers. 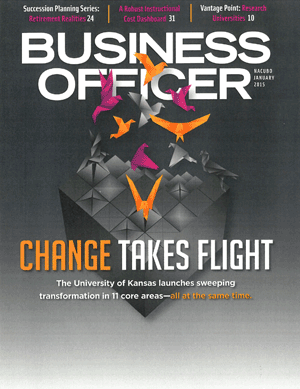 The Executive Steering Committee for Changing for Excellence believes that Shared Service Centers are not simply another way to cut costs and deal with tighter budgets; they present an opportunity to improve service and free up academic and administrative personnel to focus on the KU mission of teaching, research and service. Fiction: No one will be left in my department. Shared Service Centers will focus on HR, Finance and Research Administration transactions. Some positions currently in the departments and units will no longer be necessary as the work will now take place in the Shared Service Centers. Those who do not move to a shared service center will be reassigned to focus on the academic mission of their department and support other programmatic needs. Fiction: The Shared Service Centers will simply add another bureaucratic step to our current processes. This implementation will move work that is done within departments into the Shared Service Centers. For example, Directors and Chairs currently rely on a PRS staff member within their department to facilitate the hiring process. Following implementation, Directors and Chairs will rely on their PRS staff member in the Shared Service Center to facilitate the hiring process. Shared Service Centers will be the primary contact for some of the services that are currently performed within departments. Fact: Regional shared service centers seek to maintain the relationships that already exist among administrators and staff. While staff will move out of departments, each school and unit will be served by dedicated staff familiar with your unit and business needs. These staff will also be highly trained in the HR, Financial and Research Administration functions that they perform. Fiction: No one else in higher education has shared service centers, why should we? Many of KU’s peer universities have successfully implemented shared service centers. This list includes Oregon State, the University of New Hampshire, Cornell, and Johns Hopkins. Meanwhile, the list of those institutions in the initial phases of shared service center implementation is much longer and growing each year. Fiction: The shared service center model won’t work at KU because we are unique. Other universities which have successfully implemented shared service centers are honest about the challenges they faced at the outset, but are now convinced of the benefits. KU is indeed unique: this is why the model for Shared Service Centers at KU is being designed by committees of KU staff, including input from throughout campus.